Seeds require a specific combination of conditions to start growing and need to be planted in the soil at a particular depth. For successful growth, the needs of each type of seed must be met. Most seed packets bear detailed planting instructions. A seed contains an embryonic plant. Within the hard protective seed coat, the embryo is usually provided with a small supply of food. The embryo remains dormant until germination is triggered. Seed dormancy is broken when certain conditions are present, including water, oxygen, temperature, and light or darkness. The depth at which the seed is planted affects these factors that result in germination, allowing the seed embryo to grow. All seeds need to absorb water—usually in the form of dampness rather than liquid water—to make the seed coat swell and break, help metabolize the stored food, and thus begin growth. Oxygen is also needed for germination. 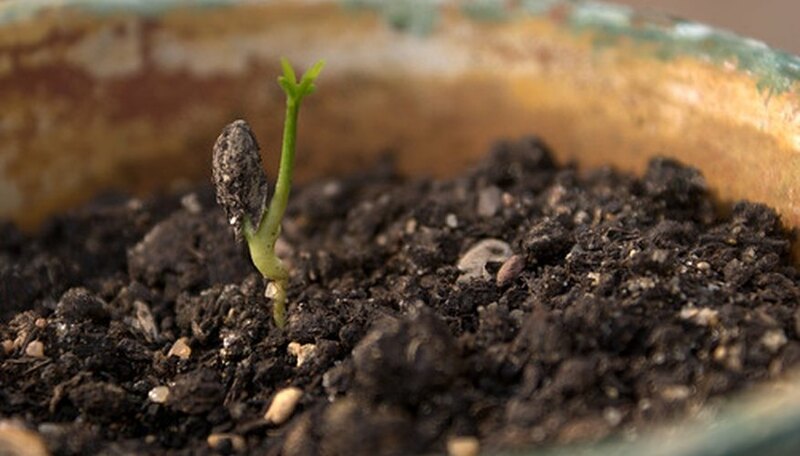 If a seed is buried too deeply in the soil, or the soil is waterlogged (which excludes oxygen), the embryo will not grow and germination will not occur. A seed will germinate only when the soil temperature is right. It will lie dormant in cold soil, but as spring temperatures rise, frozen water melts, the soil warms and seed germination occurs. If the seed is planted too close to the surface, germination may happen too soon and the plant will not survive in air temperatures that are too cool. If the seed is too deep, it may rot before the temperature rises enough to cause germination. Most seeds will germinate best in the darkness provided by a covering of soil. Many, however, require light and need to be planted close enough to the surface so light can reach them. To stop a seed that needs light from drying out, it can be lightly covered with a thin layer of horticultural vermiculite, which will retain moisture but permit the passage of light. Seed packets should bear instructions about planting depth. In the absence of this information, a general rule of thumb is to plant a seed about four times its shortest dimension, or twice its longest dimension.